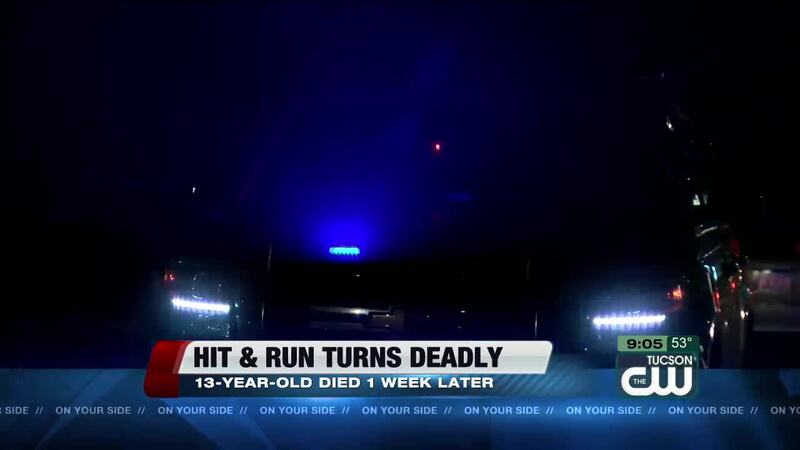 TUCSON, Ariz. — The Tucson Police Department announced Thursday that the victim of a eastside hit and run that happened on Nov. 28 passed away from injuries Wednesday. The victim has been identified as 13-year-old James Greer. On Tuesday, Tucson Police Traffic Detectives arrested 28-year-old Adrianna Gail McCutcheon for leaving the scene of an Eastside hit-and-run. TPD said detectives received an anonymous tip which took them to a home in the 1100 block of South Lehigh Drive. Officers found the vehicle wanted in connection to the collision and obtained a search warrant. The vehicle was seized and sent to the Tucson Police Impound Lot as evidence. Detectives learned the car was driven by McCutcheon. She was taken into custody and arrested for 1 count of Leaving the Scene of a Serious Injury Accident. TPD said the investigation is ongoing that could result in additional charged being filed. According to a witness, a minor was crossing Kolb road, heading east. The car was driving north on Kolb when the driver's side hit the victim.